MORRIS ITAL 1300, 1700 & 2 LITRE ; YEARS 1980-1984. MORRIS MARINA 1300, 1700, 1800, 1800TC, 1800HL ; YEARS 1971-1980. The price is for TWO discs. 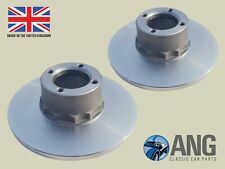 Classic mini 8.4 drilled & grooved brake discs. AUSTIN, MORRIS, WOLSELEY, MG 1100 Mk1 ; YEARS 1962-MAY 1967. There are 4 wheel stud holes per disc. These discs are suppliedNEW and boxed. The price shown is forTWO discs. AUSTIN, MORRIS, WOLSELEY, VDP, MG 1100, 1300, 1300GT MkII & III ; YEARS JUNE 1967-1974. They are suitable for all models fitted with the 'swinging' style brake calipers that were fitted from 1967 onwards. D188 EBC Premium Front Brake Discs Morris Sherpa Van. EBC Part Code: D188. Morris Sherpa Van 200. The high quality grey iron in their standard disc range includes copper to increase thermal conductivity and wear properties. D008 EBC Premium Front Brake Discs Morris Ital. EBC Part Code: D008. Morris Ital 1.3. The high quality grey iron in their standard disc range includes copper to increase thermal conductivity and wear properties. USR182 EBC USR Front Brake Discs Morris Mini. EBC Part Code: USR182. EBC USR Grooved Discs are manufactured and machined using a high-quality alloy, designed to run up to 900 degrees centigrade (glowing red hot). D008 EBC Premium Front Brake Discs Morris Marina. EBC Part Code: D008. Morris Marina 1.3. The high quality grey iron in their standard disc range includes copper to increase thermal conductivity and wear properties. D180 EBC Premium Front Brake Discs Morris Mini. EBC Part Code: D180. Morris Mini 1.3 Turbo. The high quality grey iron in their standard disc range includes copper to increase thermal conductivity and wear properties. GD182 EBC GD Front Brake Discs Morris Mini. EBC Part Code: GD182. EBC GD Discs are manufactured using a high-quality alloy designed to run up to 900 degrees centigrade (glowing red hot). Combine these EBC GD discs with EBC GreenStuff, RedStuff (Ceramic) or YellowStuff pads to increase braking efficiency and reduce stopping distances even more! GD180 EBC GD Front Brake Discs Morris Mini. EBC Part Code: GD180. EBC GD Discs are manufactured using a high-quality alloy designed to run up to 900 degrees centigrade (glowing red hot). Combine these EBC GD discs with EBC GreenStuff, RedStuff (Ceramic) or YellowStuff pads to increase braking efficiency and reduce stopping distances even more! BOSCH 986478811. INNOCENTI MINI 0.6 23 01.1984 - 12.1987. INNOCENTI MINI 0.65 23 01.1990 - 01.1995. INNOCENTI MINI 1.0 32 05.1974 - 02.1982. INNOCENTI MINI 1.0 35 05.1974 - 02.1982. INNOCENTI MINI 1.0 39 05.1974 - 02.1982. Manufacturer Part Number GD180. Capable de l'utilisation répétée de frein lourd sans frein "Automne-Off". Après avoir vendu des centaines de milliers de kits de frein freins EBC se sentent confiants que leur approche est aussi parfait qu’il obtient. Manufacturer Part Number GB5055. L'ensemble est assemblé avec fierté pour adapter votre véhicule particulier. L'ensemble est assemblé avec fierté pour adapter votre véhicule particulier. Manufacturer Part Number GB5018. L'ensemble est assemblé avec fierté pour adapter votre véhicule particulier. D114 EBC Premium Front Brake Discs Morris Mini. EBC Part Code: D114. Morris Mini 1.0 Cooper. The high quality grey iron in their standard disc range includes copper to increase thermal conductivity and wear properties. D059 EBC Premium Front Brake Discs Morris Mini. EBC Part Code: D059. Morris Mini 1.0 Cooper S. The high quality grey iron in their standard disc range includes copper to increase thermal conductivity and wear properties. D182 EBC Premium Front Brake Discs Morris Mini. EBC Part Code: D182. Morris Mini 1275 GT. The high quality grey iron in their standard disc range includes copper to increase thermal conductivity and wear properties. FERODO DDF006. AUSTIN 21A1265. AUSTIN GBD101. MORRIS 21A1265. MORRIS GBD101. MORRIS MINOR Tre volumi 0.9 28 11.1955 - 12.1961. MORRIS MINOR Station wagon 0.9 28 11.1955 - 12.1961. AUSTIN MINI 1.0 44 09.1962 - 08.1969. FERODO DDF006. MPN DDF006. Austin 21A1265. Austin GBD101. Morris 21A1265. Morris GBD101. FERODO DDF006-1. Salon de la MORRIS MINOR < span class = notranslate ' > 0,9 28 1 < span class = notranslate ' > 955-1.1 < span class = notranslate ' 12.1961 >. Frein de AUSTIN MORRIS ROVER BOSCH 986478811 INNOCENT. BOSCH 986478811. MPN 986478811. INNOCENTI MINI < span class = notranslate ' 0,55 > 24 0 1.1 987 - 12.1991. INNOCENTI MINI < span class = notranslate ' 0,6 > 23 0 < span class = notranslate ' > 984-1.1 < span class = notranslate ' 12.1987 >. MORRIS MINI COOPER S MK2. AUSTIN MINI COOPER MK2. COPPIA PINZE FRENO. maggior sicurezza ! 2 : Per l'. BOSCH BD714. Spessore disco freno [mm] 9,5. ROVER MINI 1000 30 01.1992 - 06.1993. ROVER MINI 1300 45 01.1991 - 12.1991. ROVER MINI 1300 39 01.1992 - 04.1995. ROVER MINI 1300 46 01.1992 - 11.2000. ROVER MINI 1300 37 04.1992 - 10.1996. Brake drum securing screws (front or rear drums) ,suitable for the following models;. MORRIS MINOR SERIES II (CHASSIS 228267 ONWARDS) ; YEARS 1954-1956. MPN 92092600. MORRIS MINI < span class = notranslate ' > 1.3 57 < span class = notranslate ' >-09.1962 < span class = notranslate ' 08.1969 >. MORRIS MINI COOPER 41 < span class = notranslate ' > 0 < span class = notranslate ' > 1,1-961 < span class = notranslate ' 12.1967 >. MPN 0986478811. MORRIS MINI < span class = notranslate ' > 1.3 57 < span class = notranslate ' >-09.1962 < span class = notranslate ' 08.1969 >. BOSCH BD714. Épaisseur de disque de frein [mm] 9,5. Brake Caliper Pistons. Brake Caliper Slider Pins. Caliper Rebuild / Repair Kits. Caliper Repair / Service Kits. This is a Budweg premium quality caliper rebuild kit with parts for one brake caliper. Brake Pad Fitting Kits. MORRIS MINI 850 25 01.1967 - 08.1979. MORRIS MINI Cooper 41 01.1961 - 12.1967. MORRIS MINI Cassone / Furgonato / Promiscuo 1000 28 01.1969 - 12.1980. 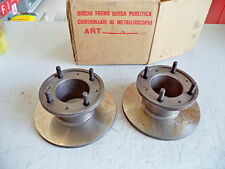 MORRIS MINI Cassone / Furgonato / Promiscuo 850 25 01.1960 - 12.1969. Part Number BBP1054. Manufacturer BORG & BECK. Morris : GBP109. Morris : GBP201. Morris : GBP246. Brake System Lucas - Girling. Fitting Position Front. Quantity Full Set. Part number for reference: BTA370. Classic Mini Drive Flange Bolts. Manufacturer Part Number GBH108. MORRIS MINOR tuyau de frein X 3 1956-1972 (pas VAN /PICK UP vous besoin A arrière plus long). Other Part Number CBS122.